This is a panoramic photo, so the depth is somewhat distorted. 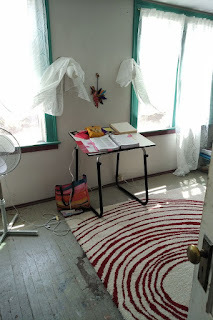 This photo was taken in natural light, which shows the actual colors of the rug, as well as give a better sense of the re-done space. Since this photo, I have updated the curtains, too, which you can see in the second photo. The curtains have a similar pattern to that in the rug. I have some heavier red and white curtains I planned to put up for a second layer, but I'm debating that decision now. For now, I like the light through the windows and, so far, the white curtains are keeping out most of the full southern facing windows heat; we aren't at the pinnacle of the heat yet, although we have had several consecutive days in the 80's. I've been in there at night and it keeps fairly dark, because there is not a street light next to our house. I may want the second, heavier layer on the other side of summer, when it starts getting cold again, to keep the heat in. Bur, for right now, I have these eggy/spiral/rock patterned white curtains.